Are you ready for a relaxing Easter? Symbolism and tradition—and a few modern touches—combine in this delicious and time-honored menu. Enjoy Passover favorites like Beef Brisket with Tsimmes and housemade Chicken Liver Mousse. New for this year: multi-course dinner packages priced per person. New menu items are springing up! Our grills are already itchin’ for summer. 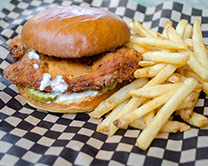 Catch our new Fried Chicken Sandwich, a buttermilk-fried breast with pickles and ranch dip on our fresh-baked bun. Want a meat-free alternative? Try our Portlandia Veggie Burger, a beet burger with zucchini pickles and veggies. Enjoy free mimosas and other brunch specials at Elephants on Corbett. 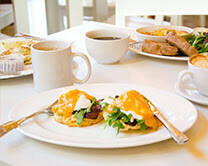 Tuck into our Challah French Toast or Southwest Eggs Benedict. Bring the whole family! 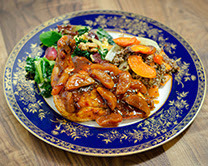 We have menu options for everyone. Our new rewards program, Thanx, is up and running. Simply put: Spending money at any Elephants retail location earns you FREE STUFF. Just sign up, and you will earn a percentage for every purchase. 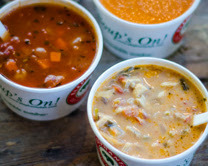 Receive a free cup of soup when you sign up!